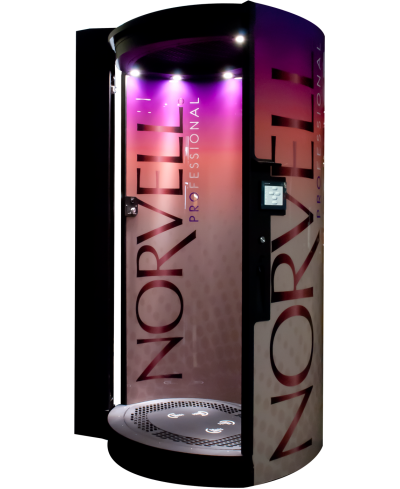 Allow me to introduce the Norvell Auto Revolution Plus sunless spray tan booth! This auto spray booth is just what many of you have been searching for. This is for someone who is a little shy about letting someone spray you, or for that person on the go who doesn't have time for a custom spray, for you busy person who forgot to make an appointment (none necessary because this booth only takes 4 minutes to tan you), and for you gentlemen who can't get a "total" spray otherwise (we prefer not to spray the guys in the buff), and finally for the youngsters who can't tan in the UV units and are too young to get a custom spray without the audience of a parent. Basically, this sunless booth is for EVERYONE! Norvell has designed this booth to give you as close to a custom spray as possible without putting the gun in a tech's hand. There is a sensor that can "see" you for a perfect spray every time! You get to choose from three great colors - Dark, Venetian or fast developing Norvell ONE Bronze and choose how heavy (dark) you want to be sprayed with that color - light, medium, heavy. Then you can add on an optimizing finishing spray and a Lunar Booster to complete your session and get the most amazing spray tan you can get in a booth! Your friends will be jealoussssss. Oh, the booth includes a heated dryer, and the entire session takes just a few minutes! Stop in and ask about our Custom Spray Tan special for Prom!